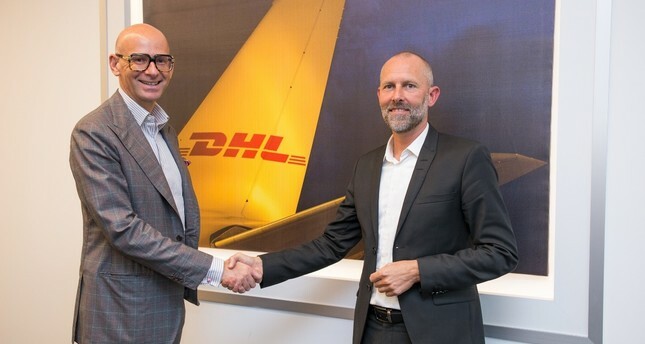 DHL Express Europe CEO Alberto Nobis (L) and DHL Turkey CEO Claus Lassen. Global logistics giant DHL, as one of the biggest foreign investors in the Istanbul Airport with an investment of 130 million euros ($147 million), is showing signs of a second investment in the country. "I have not seen an investment of [such a] magnitude such as the Istanbul Airport in Europe," said DHL Express Europe CEO Alberto Nobis, emphasizing that the European economy has been going through a stable process. In an interview with Turkish Sabah daily, Nobis said the company will be shifting its Turkey operations to Istanbul Airport by 2020. "We are making the highest investments from the aspect of both square meters and the amount in Turkey in the fast air transport sector. Turkey's regional position is getting stronger day by day. According to developments, we can start a new investment here," he noted. Turkey, where DHL has been operating for 38 years, ranks in the top five in terms of cash and profitability among the 42 countries in the European region. "Now we are making an investment that will take our presence 40 years or beyond. Because Turkey is on a critical path. It is at a very good point in terms of its location and is a promising market. We have made this investment to further increase our market share in Turkey that is still 53 percent in the coming years. In fact, rather than increasing our share, we are interested in the fact that the market will grow," said DHL Turkey CEO Claus Lassen. ce our expectations are met. Then we can take additional steps. If the market grows, we are ready to invest." When asked whether Turkey will be a hub in logistics as Leipzig, he noted that with the airport investment, the Turkish government is "paving the way for this. It is not possible to say this for three to five years. This will be possible thanks to the landing of the wide-bodied aircraft with the widening of the runways in other phases of the investment." E-commerce offers serious opportunities for global logistics sector, according to Nobis, who noted that e-commerce has become the main driving force of growth in the global trade. "… We see Istanbul Airport investment as a very important step in terms of both the growth of e-commerce and it being the first operation center with full automation and the latest technology in Turkey," said Nobis, also adding that with the great investment they have made in Turkey, DHL customers will further benefit from this potential. "When I think of all the developments in the sector in the last 10-12 years, I do not remember that I have witnessed an investment this big. There was no investment of this dimension in Europe. There is a lack of good news in Europe. In Europe, investments of this size are no longer realized. Brexit is the most talked about in Europe. Growth factors of Istanbul Airport are also attracting attention. We know that the Turkish government wants to turn it into an important hub. This investment will also contribute greatly to the tourism of the country. It will be a transit point for passengers going to the Far East," said Nobis. Lastly, he said the company's operations in Turkey would gain serious momentum with the completion of the new investment. "This is one of the most important investments within our Europe network," Nobis concluded.